You can download the image format of the brochure here and the print format here. Nordregio is a leading Nordic and European research centre for regional development and planning, established by the Nordic Council of Ministers. We conduct solution-oriented and applied research, addressing current issues from both a research perspective and the viewpoint of policymakers and practitioners. Other core competencies include mapping and GIS analysis, as well as communications and outreach. Nordregio works on commissioned projects that help policymakers and practitioners tackle economic and social, as well as more general planning and governance challenges. This involves active participation in European, Nordic and national research programmes (e.g. ESPON, Horizon 2020, Interreg, NordForsk, and national research councils in the Nordic countries). We develop new knowledge and data, perform territorial analyses on a transnational and pan-European level, as well as conducting evaluations of various European and national support programmes. 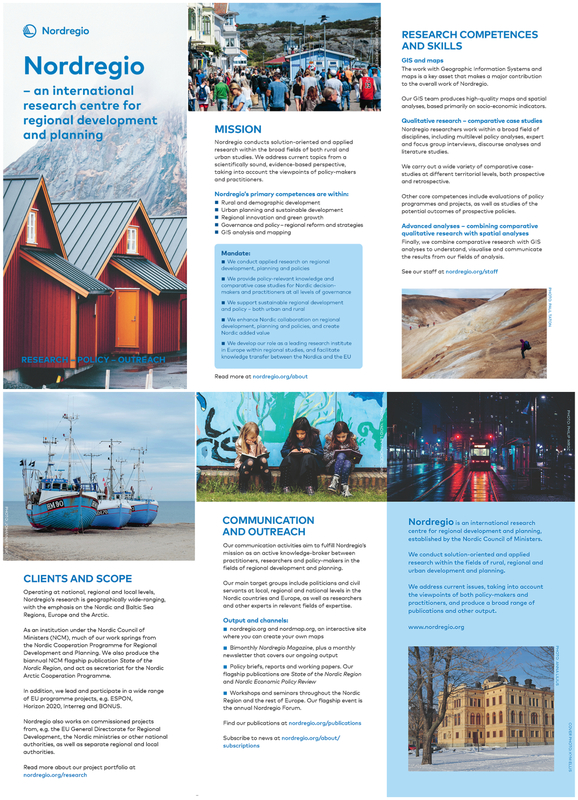 Operating at the international, national, regional and local levels, Nordregio’s research covers a wide geographic scope, with an emphasis on the Nordic and Baltic Sea Regions, Europe and the Arctic. Scientific Excellence: Nordregio is committed to producing high quality scientific, evidence-based research that can be understood and used by policymakers and practitioners to solve practical policy problems. Our research contributes to broadening the scientific and political debate on key issues surrounding regional development in both a Nordic and global context. Analytical Thinking: Nordregio has created an environment of equality and openness designed to facilitate deliberation and analytical thinking amongst highly trained researchers. Our research is based on integrity, self-reflexivity, cooperation, and a daring to challenge conventional thinking. We critically analyse and compare past and present data to find novel and innovative solutions to contemporary challenges and predict future trends. Stakeholder Collaboration and Facilitation: Nordregio provides a forum where Nordic authorities and practitioners can collaborate and work together to share knowledge and seek solutions to common problems. We encourage and facilitate interaction and open and transparent cooperation between stakeholders. Among other research environments, we are also regarded as professional project managers and attractive project partners that deliver work on-time and to a high standard. Visibility and Outreach: Nordregio is committed to promoting Nordic added value by acting as a knowledge broker between practitioners and researchers in the Nordic countries and globally. We ensure that our research is made easily accessible to our target groups and stakeholders, using a wide range of dissemination techniques and social media. Our communication team works closely with Nordregio researchers to develop carefully tailored communication plans for each individual project. Attractive Working Environment: Nordregio is a popular working environment where researchers undergo significant personal and professional development. Employment at Nordregio presents an excellent job opportunity and is a stepping stone for attractive future employment prospects.